Around 7:15 a.m. on December 1, police received reports that Ricardo Delgado drove a Chevrolet Camaro through Kissimmee, pointing a gun at other drivers in order to weave through traffic while a young girl sat in the backseat, WKMG reported. The police located Delgado and his vehicle near the scene, which was within 1,000 feet of the child’s day care center. Upon arrest, the police found a handgun and marijuana in the Camaro. Delgado now faces nine separate criminal offenses, four of which are related to his possession and use of the firearm. Aggravated assault with a deadly weapon: Under Florida Statute Section 784.021, anyone who commits an aggravated assault with a deadly weapon can be found guilty of a third degree felony. An assault occurs when someone intentionally and unlawfully threatens by words or actions to do violence to another person, with the apparent ability to do so, and along with some act that creates a well-founded fear in the other person. This crime rises to the level of aggravated assault when a deadly weapon like a gun is used. This crime is punishable by prison for up to 5 years and a fine up to $5,000. Possession of a firearm by a convicted felon: Florida law does not allow convicted felons to carry firearms in their cars or in any way concealed, unless an individual has had his or her full rights regarding firearms restored. Illegal possession of a firearm by a felon is a second degree felony under Florida Statute Section 790.23, punishable by imprisonment for up to 15 years and a fine up to $10,000. 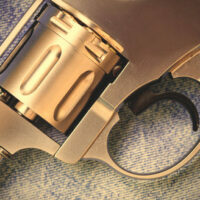 Carrying a concealed weapon: Like most states, Florida has strict concealed carry laws. It is illegal for someone to carry a hidden firearm or other weapon in his or her car or on his or her person without the proper license, under Florida Statute Section 790.01. When a person is caught carrying a concealed firearm without the correct license, he or she commits a third degree felony. Careless display of a firearm: A person can be charged with a crime for improperly exhibiting a dangerous weapon or firearm. Under Florida Statute Section 790.10, anyone who exhibits a weapon in a rude, careless, angry, or threatening manner in the presence of one or more other people, is guilty of a first degree misdemeanor. An individual convicted of this level of offense can be jailed for up to 1 year and fined up to $1,000. When individuals face such a tough situation, it is important to work with experienced criminal defense attorneys who can not only build a strong defense, but strategize a way to minimize the consequences of conviction on one or more counts. The Kissimmee criminal lawyers of Salazar & Kelly Law Group, P.A. are prepared to aggressively defend their clients in court and fight for what is right and fair. Call us today at 407-483-0500 to schedule a consultation with an attorney.